But once our work is out in the world, we have more opportunities to connect. Someone will come up after a show or a reading, or ask a question during a panel, or send us an email about our work. (I’m not talking about reviewers, here, but just regular audience members.) These responses can be wonderful, enlightening, depressing or just perplexing. Once someone came up to me after a performance of my science fiction opera with Anthony Davis, Under the Double Moon, completely convinced that I had shared her experience of being abducted by aliens. (For the record, I’ve had the good fortune to have never been abducted by aliens, or anyone else.) People have also told me the stories of their ill-fated love affairs, failed patent applications, and rejected manuscripts. They also often compare something I’ve written to something I’ve never heard of, convinced that my work was somehow derived from it. Even if, like me, you aren’t famous at all, it’s always a little bit of a crush after a public appearance of any kind, but I try and listen to everyone who comes up to me, because every comment, no matter how seemingly out-of-the-blue, is a response to my work. I am happy people have been touched, or interested, or even aggravated, by what I created. The greatest enjoyment for me is in creating the work, not presenting it. This is true whether I’m working on something alone and the ideas are actually flowing, or sitting down with my long-time collaborators to bring something to life together. And if it is a performance work, the rehearsals are always a happier and more involving experience than the actual performance itself, which goes by too quickly, and during which you are always listening for the audience’s response. But there is nonetheless something completely gratifying about hearing an audience laugh (when they are supposed to) or to see someone look like they are about to cry when the hero dies. You’ve hit the mark; they got it. And then it doesn’t matter if afterwards they ask you about your personal experiences on Alpha Centauri; they wouldn’t be asking if you hadn’t touched them. Follow me on Twitter @DatherToo. 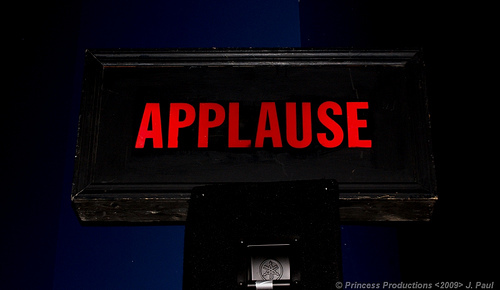 Applause Photo courtesy of Princess Theater—Raising the Curtain via Creative Commons License. Some rights reserved. 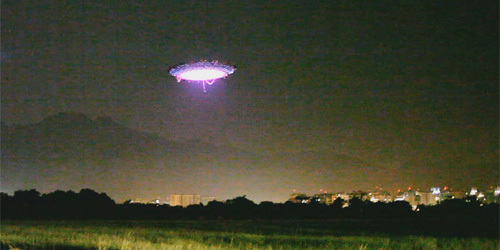 UFO Photo Courtesy of Dommeruk Creator:Dominic Harris via Creative Commons License. Some rights reserved. This entry was posted on Sunday, February 2nd, 2014 at 7:32 pm and is filed under Creative Process, Getting Support, Publicity. You can follow any responses to this entry through the RSS 2.0 feed. You can leave a response, or trackback from your own site.